Abu-Zubaydah was born 03/12/1971 in Saudi Arabia. He went to Afghanistan, probably not for the first time, in 1995 through Spain, where he met Imad Yarkas before arriving to Afgahnistan. In Afghanistan Abu-Zubaydah associated with Sheikh al-Liby , later the al Khalden training camp commander in Afghanistan. Abu-Zubaydah became the chief logistic administrator and recruiter of al Qaeda when Osama Bin Laden arrived to Afghanistan in the end of 1996 and became no’ 3 in Al Qaeda. On 12/1999 Jordanian security services foiled a big terror attack destined to the millennium eve 12/31/1999, the JORDANIAN MILLENNIUM, after intercepting a phone call from Abu Zubaydah to the local Jordanian leader of the plot Khader Abu Hoshar. 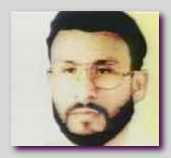 Therefore Abu Zubaydah was sentenced in 2002 to death in absentia in Jordan. A. Ahmed Ressam who was arrested in Port Angeles when he arrived from Canada on 12/14/1999. B. The foiled attack on USS The Sullivans in the port of Aden, Yemen, on the 01/03/2000 with a bomb-laden boat. C. The foiled attack to blow up the US Paris Embassy, France on 11/2001. After Mohammed Atef was killed in operation ” Absolute Justice “ in Afghanistan in 11/2001 Abu Zubaydah took over the military command of al Qaeda. * Abu Zubaydah succeeded to deceive his interrogators in Guantanamo and to fabricate al Qaedas’ plots intended against USA causing several times false general terror alerts.